Dr. Susmit Kumar, 328 pages, iUniverse. $23 (hardcover) / $17 (paperback). Oil has been at the heart of the US-Muslim conflict for as long as we can remember. 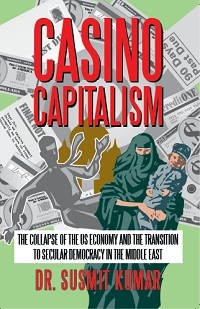 In his new book on the future of global capitalism and Islam, Dr. Susmit Kumar places this tremendous conflict of interests in a perspective that is both chilling and exciting. On one hand he portays a modern, ultra-dynamic Asia contrasted with a relegated, humbled West; on the other hand a new world of modernized societies united in a common effort for global progress. Wall Street is a “casino” where the dice are “loaded in favor of the bankers and the ultra-rich.” Keeping afloat only by selling enormous amounts of dollars to China every day, the US government allows speculators to continue to “squeeze the juice out of the economy." If China plays its cards carefully, after the end of the global economic crisis, it could emerge as the strongest country in the world, Kumar reckons. The coming U.S. economic collapse will serve to accelerate drastic political changes in Islam and create a new, multipolar order. In the process, Islam will embrace modernity and change its antiquated outlook in many ways, Kumar predicts. An overdue process that other religions underwent long ago, the modernization of the world’s biggest religion will make Islamic countries progress greatly both at home and on the world scene. The book essentially argues that growing economic democracy and a rational modernization of existential and social outlooks will provide the necessary sustainable environment that will allow us all to continue to prosper and progress together. This book is not only an important contribution to the growing critique against capitalism and corrupt political and social systems. The author has obviously taken great pains to process an enormous mass of historical and current data, turning it into easily readable, convincing arguments in favor of a more liveable world society than the one we have at present. / T.Ø.